A number of Palestinians were kidnapped by the Israeli occupation forces (IOF) at daybreak Monday in abduction sweeps rocking West Bank provinces. 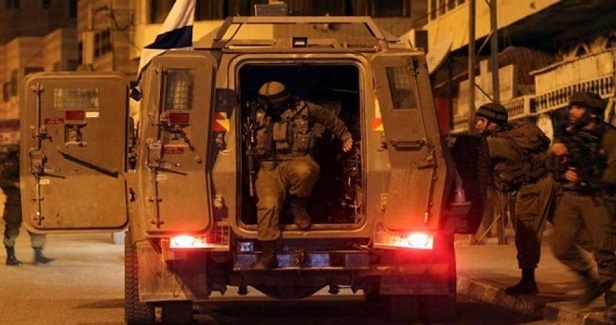 The occupation forces kidnapped four Palestinian young men from Nablus shortly after rolled into the city and raked through residential neighborhoods. The list of arrestees included ex-prisoner Alaa Hmeidan, from al-Ma’ajeen neighborhood, in Nablus. Hmeidan had served as the head of the Islamic Bloc at An-Najah University. At the same time, an Israeli military patrol stormed the home of the Palestinian MP Nizar Ramadan in Senjer area, near al-Khalil’s town of Dura, in the southern occupied West Bank. Ramadan said on his Facebook account that Israeli soldiers wreaked havoc on his family home and interrogated his relatives. MP Ramadan had been held for 10 years in Israeli jails. The campaign culminated in the abduction of the Palestinian young man Abed al-Sweiti by Israeli soldiers from al-Khalil province.